The folks both loved this Italian Cheese Stuffed Meatloaf. I mean, why not: it’s meatloaf and it has a great “Italian” flair. Italian Cheese Stuffed Meatloaf is much easier than it seems. The key is to use fresh mozzarella for the ooze factor, and to make sure there’s not cracks or holes before it goes in the oven. Take a few minutes to smooth the roll out. Laying it out on foil and measuring (yes, I measured with a ruler) makes it super easy to get the roll just right and get it transferred over to the baking sheet. It makes for easier clean up, too. As far as stuffing this with all kinds of tasty Italian type things, this is pretty much riffable. If I had any pepperoncini, I think I would have added it, too. Just don’t overstuff – you DO have to be able to roll it up. Let it rest after you take it out of the oven to let the cheese have a minute or two to “collect itself.” It will stay in the meatloaf much better and not ooze out. Make this on 15x10x1-inch pan. Put out a large piece of foil and spray foil with cooking spray. In large bowl, add ground beef, eggs, bread crumbs, Parmesan cheese, Italian Seasoning, salt, pepper, garlic and 1/2 cup of the pizza sauce until well combined. On the foil, shape beef mixture into 12×10-inch rectangle. Pay special attention to make sure beef is in an even layer with no holes. Top evenly with mozzarella cheese, roasted peppers and olives to within 1/2 inch of edges. If desired add sun-dried tomatoes or pepperoni. Starting with one 10-inch side, roll up; pinch & press seam to seal. Move it seam side down and transfer, carefully, foil and all to the baking sheet. Look over the roll carefully and use a finger dipped in a little water to smooth out any cracks or holes, paying special attention to the ends of the meatloaf. This entry was posted in Click here for Bargain Meals, Click here for Fabulous Food Posts and tagged Bargain Meal of the Week, Bell Peppers, Cheese, Frugal Hausfrau, Ground Beef, Italian, Meatloaf, Mozzarella, Olives, pepperoni. Bookmark the permalink. Sorry to reply late! It was really super easy! I was stressed about it when I started. I made it on the aluminum foil and it worked so well! 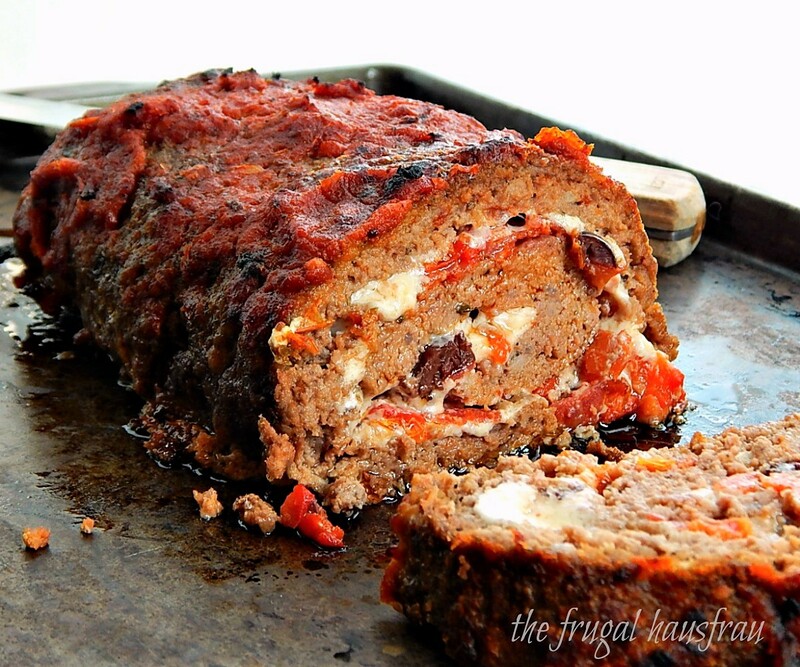 Meatloaf stuffed with cheese looks stunning! Sunday dinner for sure! LOVE, LOVE, LOVE! never thought to put olives in a meatloaf, darn it. you may be doing a better job with meatloaf than me!!! 😀 Well done! lol!! Glad you stopped by, because I’ve been missing your blog!! I’ll be by shortly so I can see what you’ve been up to! It was actually a little cool when I cut it, which helped keep it together but then I didn’t get that great oozing out! Oh yum yum yum. Yet another one to go on my list of yours to make! You make food that speaks to me, for sure! Wait, I just printed it and the pizazz add-ins include pepperoni, not pepperoncis. I’d go with the pepperoncis, for sure! Oh, I used pepperoni & mentioned I’d add the pepperoncinis if I had them – I’m going to add them to the list of add ins!! This is such a great idea! So delicious and looks lovely! Love this Mollie and I’m wondering whether I could make this vegetarian changing out the beef for perhaps lentils and mushrooms. What do you think? I think it would be great as long as you can make the mixture hold together into a tight loaf. Maybe instead of rolling you could just put the cheesy stuff down the middle and kind of fold it over? Thanks for the tip Mollie – although after just seeing your cauliflower gratin I may go for that instead for Christmas Day! I always get the worst case of the Hungrys if I look at blogs or Pinterest before bed!! THis looks delicious! I have to try the recipe. Hi Kyla – thanks! It was kind of a showstopper but most of all the flavors. And that cheese, lol! WOW! Would you look at this beautiful meatloaf!! Those ingredients had to have been amazing with this cheese stuffed meatloaf! Thanks, Loretta! I keep thinking I’d like to make this and riff off some other flavor profiles, too – Mexican, maybe Cuban? Maybe one day! That looks DIVINE! I definitely will be making this. Perfect winter comfort food. Thanks! I like making something different in between Thanksgiving and Christmas – a few days of ham and or turkey and I’m dying for something Italian or Mexican!! wow – this is so delicious and healthy! !